Bung Boraphet is the largest freshwater swamp in Thailand. Some parts of the swamp have been declared the Bung Boraphet Non-Hunting Area under the care of the Wildlife Conservation Division. Bung Boraphet is also a fish breeding ground where the Department of Fisheries has set up the Bung Boraphet Fishery Development Station. Bung Boraphet Non-Hunting Area or Waterfowls Park : Take the Nakhon Sawan-Tha Tako route (Highway No. 3001) for about 20 kilometers and turn left for 4 kilometers to the park. The park has an exhibition in the form of a nature study center, a garden and accommodation. 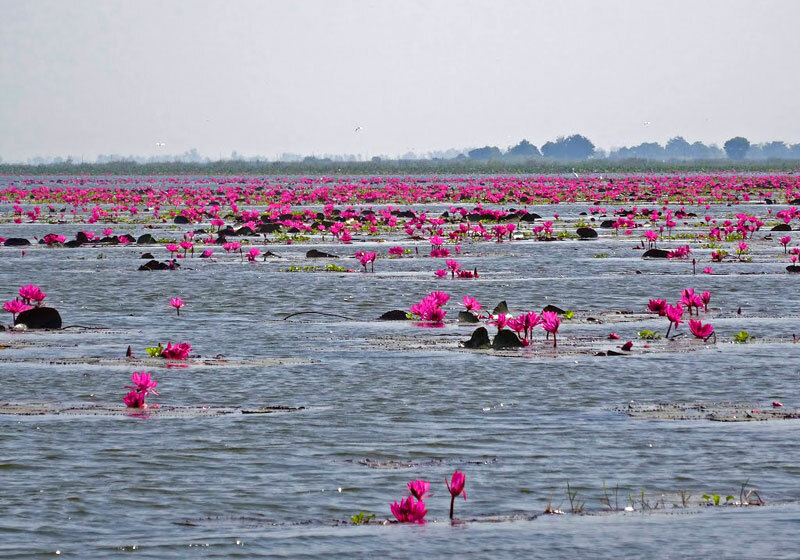 Short Description: Bueng Boraphet, or Boraphet Marsh, is the largest freshwater lake in Thailand, boasting over 200 square kilometers of land and earning it the moniker of “Northern Sea” or “Great Lake”. Almost 200 species of animals and plants have been found in the area, the rarest including the white-eyed river martin and the Siamese Tiger Fish. In March, fluttering grebes migrate to the lake, also home to Asian Open Bills and Pheasant-Winged Jacanas.